Copyright 1997 Mark Stavish All Rights Reserved. Mention alchemy to someone and what do they usually think of? The Middle Ages with old men in some forgotten attic, laboring over bubbling flasks filled with some unknown fluid; or in front of an oven, trying to turn molten lead into gold. These are the images of the alchemist that time, mythology, and prejudicial history have handed down to us. It is true, that many of the early alchemists were the forerunners of the modern sciences. Physics and chemistry are indebted to these early ‘puffers’ as they are despairingly called, for from their hours of sweat and travail, a host of modern advances came: porcelain, alcohol distillation, acids, salts, and a variety of metallic compounds, are the results of early alchemical experiments. But if alchemy wasn't just a foolish waste of time in the search for a means to turn base metals into gold, what was it? Alchemy , or “Al-Kemi”, is said to be derived from Arabic or Egyptian meaning either “divine chemistry” or possibly “black earth” referring to the silt deposits from the annual flooding of the Nile river. However, regardless of where the word ‘alchemy’ began, it has come to mean a very special form of spiritual development. From Plato's Greece to the European Renaissance, ancient Egypt was held to be the land, if not the origin, of all things mystical. The Egyptian god Thoth, called Hermes by the Greeks, was said to be the father of all magical arts and sciences, with numerous books on the laws governing creation being attributed to him. These books became the basis of most Western occult teachings, and are known as “The Hermetic Corpus” or the “Body of Hermes”, and refers to the total collection of works attributed to the ‘scribe of the gods’. 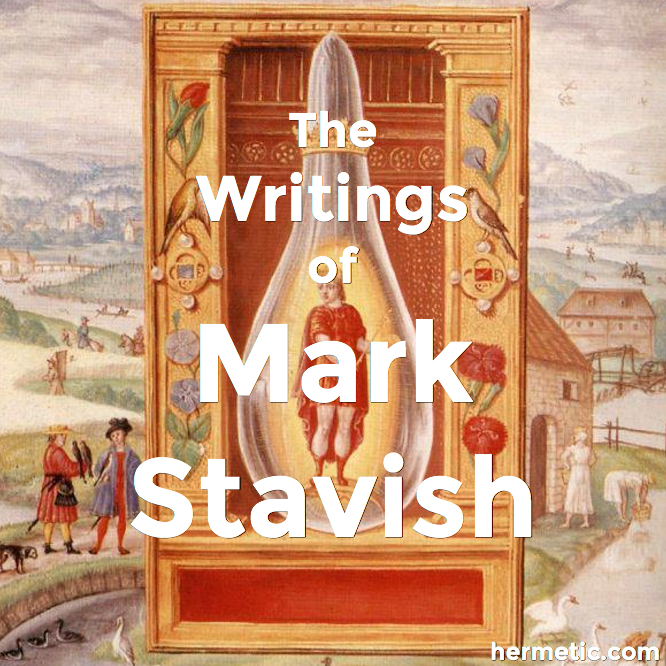 The teachings and practice contained in these writings are called “Hermeticism”, and in the Renaissance came to include aspects of Jewish mysticism (kabbalah), alchemy, the use of ritual, and communication with super-celestial beings, or angels. It is important to remember, that in the ancient world and until end of the Renaissance (16th century), magic was seen not as superstition, but as a logical and coherent means of understanding the universe and controlling ones destiny. Magic, imagination, and magnetism are all related , both through there root -mag, as well as how they are seen through the mind of the magician or alchemist. For the magician, or even the alchemist, the universe is perceived as a reflection of the imagination of the Godhead. Its laws are consistent and logical, and if we are created in the image of the Creator, then we can also create as the Creator has - through the power of imagination. Intense imagination creates a stress on the ‘fabric’ of the universe, drawing to it magnetic power, thus bringing our images to fruition. The fundamental ideas of Renaissance magic and alchemy are also found in Eastern yoga, and are the basis for the New Age movement, as well as hypno-therapy, guided visualizations for mental health or cancer treatment, affirmations and an assortment of other psycho-spiritual practices. Until the last half of this century, though, most of these spiritual practices were kept secret or hidden, mostly out of fear of political or religious persecution. Hence, they became known as occult or “hidden”. Since many of them used the same signs, symbols, and literature as contemporary religions - Christianity, Judaism, and Islam - the hidden, occult, or Hermetic arts and sciences became known as esoteric or the secret meaning behind ‘exoteric’ or everyday religious practices and dogma. This fear of imprisonment, or death, limited instruction in esoteric practices to a trusted few, and only through a process of slow, careful, symbolic rituals and cryptic teachings known as initiations. Each of these initiations, or gradus, symbolized a step, or grade, in the students inner journey towards illumination. During the 17th , 18th, and 19th centuries dozens of initiatic orders and societies were established across Europe for the dissemination of spiritual teachings. The most prominent of them being the Rosicrucians, Freemasons, and Knights Templar. Some of them taught their members through moral instruction, such as the Freemasons. Others, such as the Rosicrucians, taught practical mysticism, the use of ritual, the structure of the universe through kabbalah, as well as laboratory alchemy. Many of these organizations exist in Europe or the United States in some form today. In alchemy, however, each of its steps or phases represents not only an interior awakening (initiation), but also a physical, practical technique performed in the laboratory. The physical, laboratory work becomes a means of verifying spiritual and psychic expansions in consciousness. “Alchemy is an initiatic system in which you have no delusions. It is the only initiatic path where there is an objective control in the laboratory. So if your experiment shows you've gone beyond the ordinary material laws of the universe, it shows that you're an alchemist that has had an interior awakening, and that corresponds to the rule which says, ‘You will transmute nothing if you have not transmuted yourself first.’” Says Jean Dubuis, founder and first president of the French alchemical organization, The Philosophers of Nature. Dubuis, has actively practiced alchemy and related esoteric arts for nearly sixty-five years. His spiritual path began when he had a spiritual awakening at the age of twelve in the island cathedral of Mont Saint-Michel off the coast of Normandy. This awakening has led Dubuis to a lifetime of activities and intimate involvement in European esoteric circles. He has held positions in the French speaking branch of the Rosicrucian Order, AMORC, presiding over its Illuminati section of higher degree students; as well as various esoteric orders and societies. “Alchemy is the Science of Life, of Consciousness. The alchemist knows that there is a very solid link between matter, life, and consciousness. Alchemy is the art of manipulating life and consciousness in matter to help it evolve or solve the problems of inner disharmony. Matter exists only because it is created by the human seed. The human seed, the original man, created matter in order to involute and evolve. You see, if we go beyond what I said, the absolute being is an auto-created being, and we must become in its image auto-created beings.” Dubuis stated during a recent interview at the annual conference of The Philosophers of Nature. A similar statement was made by fellow Frenchman and alchemist Francois Trojani, during an interview with Joseph Rowe in the Summer 1996 issue of Gnosis. Because of Dubuis' extensive professional career in electrical engineering for a major international electronics firm in France, and work in the field of nuclear physics with Nobel Prize winner Jollio-Curie, he has been described by fellow alchemists as one of the few people easily at home with either a periodic table of the elements or a kabbalistic diagram. This interest in electronics has led Dubuis to invent several devices designed to assist in experiencing out-of-body journeys and assist people in having a general initiatic experience. “In ancient times, as human evolution was going, we passed from kabbalah to alchemy. Now, I think that with the evolution of the world, perhaps we can put in the initiatic path electronic methods. It doesn't stop people from having to work themselves, but initiatic work will be easier. This corresponds to the fact that the whole evolution of the world must be accelerated.” Dubuis stated. Dubuis stated that his ‘boxes' are more advanced than consciousness altering devices currently on the market. His work through light and sound synchronization as do existing machines, however, through a complex series of mathematical computations, Dubuis says that he can specify the experiences one will have with his invention. The author has experienced two generations of Dubuis ‘mind machines' as they are called, and can attest to their superiority over existing ‘off the shelf' equipment. The clarity, impact, focus, and lasting effect of them was quite astounding. Just as esoteric initiation seeks to repair the psychic damages in humanity, so does its step-child, modern psychology. As a result, most folks today are familiar with alchemy through the extensive writings of Swiss psychologist Carl Gustav Jung. Jung was attracted to alchemy through a series of dreams he experienced, as well as those of his patients, and their resemblance to alchemical symbols representing the stages of self-development, or individuation. However, for Jung, the entire alchemical work, or opus, was viewed from strictly psychoanalytic perspective. Transmutation was not the changing of physical matter, but of psychological matter, from destructive problems, into life enhancing attributes. Some of Jung's seminal works outlining the process of human individuation, or self-becoming, are found in his Alchemical Studies; in which he interprets the meaning of the key stages and symbols of alchemy to explain the internal stages of human evolution, or what alchemists call, interior initiation. Laboratory alchemists cautiously point out that despite his contributions, and the critical aspect of psychological work in alchemy, Jung is not considered a real alchemist. According to Dubuis, and others, for alchemy to be real alchemy, it must work on all levels of creation - spiritual, mental, emotional, and physical. While one or more can be left out and a transmutation of some sort effected, the results are not considered to be alchemical. “It is true that Jung made some additions to symbolism and gave people a means to look at their interior life. As regards to alchemy, Jungian psychology shows that alchemy is a universal art and science, and can lend itself to anything, but to reduce alchemy to a theraputic allegory is a mistake.” Stated House. Russell House, of Whinfield, Illinois, is the current president of The Philosophers of Nature, and has studied alchemy with, Jean Dubuis, Orval Graves, Frater Albertus, and Manfred Junius, several of this centuries leading laboratory alchemists. From 1989 to 1993, House also co-instructed the alchemy classes taught at Rose+Croix University, sponsored by the Rosicrucian Order, AMORC, in San Jose, California. Along with psycho-spiritual growth, and physical transmutation, alchemy has long been associated with creating cures for ‘incurable diseases' as well as near physical immortality. Dubuis has suggested that a carefully prepared tincture, or alchemically prepared medicine extracted with purified alcohol, made from acorns might prove useful in fighting cancer and some auto-immune diseases. However, at least one of the major contributions of alchemy to alternative medicine is a little more accessible than either of these, that is, homeopathy. Available in most drug stores and super markets, homeopathic medicines are based on the alchemical practices of the Swiss 16th century alchemist Paracelsus. However, it was not Paracelsus that created homeopathy, he only supplied the theory that “like cures like” and that smaller doses of medicine could cure more easily and quickly than large doses. Alchemical tinctures, like homeopathic medicines, are created from plants, minerals, and metals. Homeopathic treatment was formulated in 1796 and introduced to the United States in 1825. In Europe alchemically prepared and homeopathic medicines are available to the general public. Since its inception alchemy has been associated with the idea of transmutation, or the fundamental changing of one thing, usually a base metal such as lead, into something else, in this case gold. Trojani is quoted as saying that transmutation has taken place and continues to be done. The reason given is that alchemical operations do not take place on the level of the periodic table of elements, but instead on the fabric of time and space itself. That this work on the elements on space and time energy constitutes work directly on oneself. In fact, Dubuis, Trojani, and their predecessor Francois Jollivet-Castelot all agree that not only is transmutation possible, but that it might not require much of the high-tech, high-energy equipment we have come to associate with sub-atomic physics. Jollivet-Castelot wrote a book for the aspiring alchemist, Comment on devient alchimste (1897), or “How to Become an Alchemist”, outlining the range of Hermetic disciplines required, and gave practical advice on purchasing laboratory equipment, as well as the moral requirements of the alchemist. Harvey Spencer Lewis, the founder and head of the American Rosicrucian Order, AMORC, was familiar with Jollivet-Castelot and his work. In 1915, Lewis himself is said to have transmuted a piece of zinc into gold using little more than an open flame and a crucible. The accounts of this public demonstration have been re-published several times in the organizations magazine, The Rosicrucian Digest (March 1942). In addition, in the August 1926 edition of, The Mystic Triangle, AMORC published Jollivet-Castelot's account of his own transmutation of base metal into gold, as well as the recipe for carrying it out. In more recent times, alchemy has been investigated as a means of supplying cheap energy and for the potential creation of ‘super metals'. At the Palladian Academy's conference in January 1997, near Vichenze, Italy, Professor Christopher McIntosh, author of The Rosicrucians (Samuel Weiser Publications), and member of UNESCO's Educational Office, Hamburg, Germany, mentioned that the United Nations had recently sponsored a conference of its own in which alchemy was considered as a possible tool for the creation of new alloys. Along similar lines, Dubuis offered some insights into the phenomena of UFO's. “First of all, there are two hypotheses for extra-terrestrials. The first hypothesis says, that on earth, if you are close to the North Pole, there is some kind of fraternity of advanced people that checks on the global functioning of humanity, and that the flying saucers are theirs. The second hypothesis is that you cannot come from distant systems to earth in everyday physical conditions, so I think that things happen thus. In the system that they start from, they put advanced people onboard, and the speed of energy is multiplied by a hundred thousand or a million, they can come here rapidly, and when they enter the aura of the earth, they are brought back level by level and re-materialize. I don't know, and don't want to know if the Rosswell (New Mexico) story is true, but the details that have been given lead me to believe it is true, because they found material that go back to the invisible where they should be. They said the brain of the person had no barrier, this means that they are people that have no barrier between the visible and the invisible worlds. I don't know about the other organs. If it is a fake, then the people who have produced it have a very big knowledge of the occult.” Dubuis stated. If you are interested in becoming a laboratory alchemist, then get prepared for a long haul. The experts say that to become involved in the “Royal Art” involves the synthesis of several Hermetic disciplines, among them, traditional kabbalah, astrology, tarot, and Renaissance magical theories and practice. Plant work is the first ‘matter' worked on, because the principles used are the same as in the more famous, and dangerous, metallic and mineral experiments. There are few organizations offering courses in practical alchemy, although several graduates of the famous, but now defunct, Paracelsus Research Society, teach what they have learned, if you can find them. PRS was established by Albert Reidel, or “Frater Albertus”, author of the now classic work for beginners, “The Alchemists Handbook”. Manfred Junius, has combined Indian Ayruveda and Western alchemy in his more technical book, “A Practical Handbook of Plant Alchemy”. Although his techniques require a little more laboratory equipment than those of Albertus'. Other texts exist, but are either difficult to obtain, or deal with metallic aspects of alchemy. Those wishing more personal instruction can contact the Rosicrucian Order, AMORC in San Jose, California. However, their summer course in alchemy is often open to members only and is run irregularly. The Philosophers of Nature (PON) offer a correspondence course covering all aspects of “the Great Work” including a highly informative two-year course on plant work, followed by a six-year course on metals and minerals. PON also sponsors an annual week long conference, in the spring or summer, offering practical instruction, as well as a ‘traveling seminar' for interested groups. Both organizations can be contacted via their Websites or traditional correspondence. 125 West Front Street, Suite 263 Wheaton, Il 60187.